Most daring picture I’ve seen in quite a while. No wonder some people hated it. It’s good that a German made it because otherwise it wouldn’t feel right (and probably wouldn’t have been as good). Probably if someone made a movie about some conflicting chapters of my country’s history, I’d hate it no matter how well it was done. 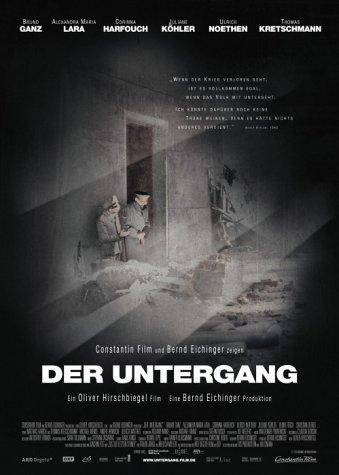 But in the case of Downfall (Der Untergang), I have enough emotional distance to say I liked the movie a lot. 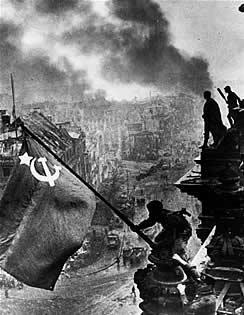 The movie is told from the point of view of the main two groups in which Berlin’s population was divided during the Russian assault: those who fought on the surface (military and civilian) and those inside Hitler’s bunker (high-ranking German officers and Hitler’s personal staff). But the point of view doesn’t come from these people’s ideology, but instead focuses on their human condition. That way, the movie dares to feel compassion about these human beings who made a terrible mistake and now are paying the price. I read that Wim Wenders hated that Hitler’s corpse is not shown, because it was like granting the tyrant his wish. Before watching the movie I tended to agree with him, but after seeing it I think the choice of not showing Hitler’s corpse makes sense from a narrative point of view: the guy must have been bigger than life to those in the bunker and since that part of the movie is told from their point of view (especially of his secretary), it seems fitting that they would treat the corpse with respect. Exposing the corpse would seem gratuitous, no matter how much we dislike the guy. I’m not saying that I know more about filmmaking than Wenders, maybe he’s right, but I think I kinda understand why the corpse business was handled like it was. Berlin seems a very close representation of hell on Earth: a place without hope. At some point near the end, when Russian victory is imminent, one German guy asks another who had been making plans to commit suicide (paraphrasing:) “why are you so obsessed with killing yourself?” and the guy replies (paraphrasing again:) “why are you so obsessed with staying alive?”. Religion aside, both questions seem equally valid in that situation. I liked how the movie creates a surreal atmosphere without any aesthetic excesses: the parties, Eva Braun’s smile, Hitler‘s plans for a counteroffensive, the suicides, the children-soldiers, the people hanged in the streets by the nazis near the end of the battle. There’s a scene in which Hitler is seen wandering the bunker in the dark and he looks like a ghost. The surrealism affects also the moral plane. I liked the way it’s shown how the circumstances blurred the distinction between loyalty, honor and madness, like when Hitler’s secretary says something like “my family told me not to get involved with the Nazis. How can I go back to them and say ‘when things didn’t work out, I realized I was wrong?’”. On the other hand, at the beginning of the movie, all those guys leaving Berlin to, supposedly, fight on the frontlines or prepare the resistance somewhere else or whatever, seem like rats fleeing a sinking boat. There are some touches of humor throuhgout the film, but they are not gratuitous; like the rest of the movie, they reflect the darkness and madness of the final days of the Third Reich. And they’re not only clever and insightful, they’re funny as well. In some parts of the movie Hitler seems like an antenna that irradiates madness to all those around him, and it feels that, like Sauron, he has to be killed so everything he has created fades away and the war can really end. But this doesn’t mean that the movie makes Hitler the only responsible for the Nazi horrors and doesn’t acknowledge the responsibility of the German people in general. There are at least two scenes in which a character (a different character in each scene) says something like (paraphrasing:) “the German people gave the power to the Nazis and now they are paying for it”. In my opinion, an awesome movie, but I can understand if others think otherwise.